Here's the thing about a lot of science-fiction post-2001: A Space Odyssey: At a certain point, if you aren’t paying attention to every little detail, things start to make absolutely no sense. 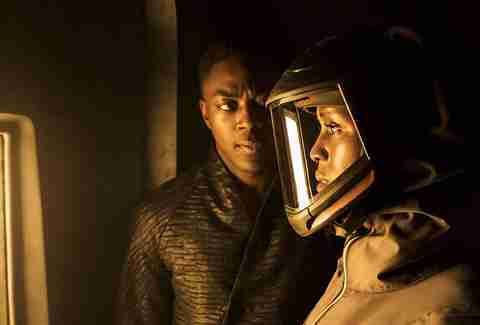 In Syfy's event series Nightflyers, this effect is compounded by the very fact that, as the crew of the Nightflyer floats ever closer to their extraterrestrial goal, things on board the ship start getting Very Weird. When the band of buddies fly the Nightflyer out into deep space to make contact with what they believe is alien life -- a probe from the volcryn -- they find out that whatever is out there is emitting the same energy, albeit way more powerful, as their resident violent telepath they've brought with them to communicate with the otherworldly force. About halfway through the season, the volcryn energy and the spaceship itself -- which happens to be somewhat possessed -- begin messing with the crew's minds, sending them memory hallucinations and making all telepaths onboard (twist: there are actually two!) more powerful, and therefore more dangerous. The malevolent force inside the ship turns out to be its reclusive captain's mother, Cynthia (Josette Simon), who uploaded her consciousness into the Nightflyer's computer core before she died so she could control everything even after her death. When tech expert Lommie (Maya Eshet) attempts to excise her consciousness from the ship, Cynthia instead takes over Lommie's body and attempts to turn the ship around and head back home, or, barring that, destroy the massive alien consciousness they're all swiftly approaching. That's a lot to unpack, and the plot is complicated by the density of action. There are plenty of revelations within the last three episodes of the show, like the fact that both telepaths, Thale (Sam Strike) and his handler Dr. Agatha Matheson (Gretchen Mol), can astral project; the fact that the handsome Captain Roy Eris (David Ajala) is actually an extremely old man who lives in a tube; the fact that Eris and his lover Melantha Jhirl (Jodie Turner-Smith), genetically engineered from birth to be an ideal astronaut, are actually siblings; and the fact that Karl D'Branin (Eoin Macken) figures out that the volcryn presence outside the walls of the ship is able to transport him to a parallel timeline in which his daughter never tragically died. It's this last detail that actually has something to do with how the story ends. Karl steals an escape pod and shunts himself into the mouth of the jellyfish-like volcryn, ending up getting blinked out of existence in this timeline and into what appears to be a different one, where his daughter runs out of her room to hug him and welcome him home. Meanwhile, the Nightflyer, reeling from Cynthia's sabotage, is swiftly overheating, its nuclear reactors threatening to explode and destroy it and the alien life form outside. Lommie's consciousness, trapped inside the ship's computer, is able to completely shut down all systems while the remaining crew huddle together for warmth in the mess hall, sending the Nightflyer tumbling toward whatever awaits it inside the volcryn beast. There's a lot of nonsensical storytelling left unexplained. Why give two characters the ability to astral project, only for one to kill herself and the other never to do it again? Why have one character go on a murder spree for an entire episode, then act like it never happened? Why end on such a massive cliffhanger? 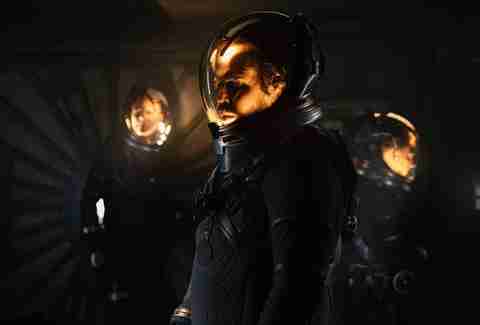 If the answer to these questions is a second season of Nightflyers, expanding beyond George R.R. Martin's creepy source material, it offers an opportunity for answers further down the line. But for now, it's left so open-ended it lends itself well to plenty of fun theorizing. "The connections we make, they're everything," Lommie says as she confesses her love to Mel within the finale's final minutes (another subplot that goes nowhere). Karl D'Branin boarded the Nightflyer expedition to find a cure for the disease that killed his daughter and that is currently ravaging Earth, but ends up finding his way back to her by, presumably, leaving his home universe in search of a new one. Is the volcryn's power that it can give a person anything he wants, including a journey to another universe? What's going to happen to everyone else on board the ship when they, too, reach the volcryn? Will they get sent back to their happiest moments, yanked out of a universe that no longer means anything to them anymore? "My ship was designed to explore new worlds," Captain Eris says in voiceover, as his ship falls through space. "It was built to expand the human horizon across the solar system. But this discovery, this singular opportunity to make contact with a higher power, to pursue a knowledge beyond our own, a knowledge that could unlock our potential and save mankind itself: This is the Eris legacy. And the Nightflyer can take you there." Where there actually is, is anyone's guess.